How much does it cost to travel to Nicaragua? How much money will you need in Nicaragua? C$1,110 ($34) is the average daily price for traveling in Nicaragua. The average price of food for one day is C$332 ($10). The average price of a hotel for a couple is C$672 ($20). Additional pricing is in the table below. These average travel prices have been collected from other travelers to help you plan your own travel budget. How much money do I need for Nicaragua? Nicaragua is growing in popularity with travelers from around the world. It still feels less discovered than many countries in Central America, and it's a little more rough around the edges than its neighbor, Costa Rica, but that only adds to its charm and appeal. It's rustic nature also means it is a great budget destination where you can stretch your dollar quite far. As its popularity continues to grow, you can only expect the costs to continue to rise, so now is really the time to visit Nicaragua, while it remains somewhat undiscovered and off the traveler's radar. You'll be surprised at how affordable a vacation in this tropical country can really be. There are countless things to explore in Nicaragua. There are great beaches with good surfing opportunities, beautiful cities like Granada, and outdoor adventure activites on the island of Ometepe. If you're interested in hiking you will find no shortage of options. If you're a history buff, the area is rich with colonial architecture and history. If you're a beach goer looking to catch some rays and waves, you'll find some isolated and beautiful beaches that are well worth the trip. Nicaragua is a great travel destination for everyone. Despite its low costs, there are still some tricks for making it even more affordable. Perhaps one of the most important pieces of advice is to carry small bills. If you're crossing the border from Costa Rica in particular, make sure you break down all your larger bills into change. It is virtually impossible in some parts of Nicaragua to find someone to make change. Food options are also very cheap in Nicaragua. In particular, try to dine at restaurants that offer buffets, referred to as fritanga. You will get a great value as the buffet often includes rice, meat, cheese, and salad at a cost of only a few dollars. Another tip for saving a few bucks is to return any glass bottles to the place where you purchased them. Store owners recycle the bottles and will give you a little cash back on your purchase. It's also a great way to help the environment. Also make sure you negotiate for prices, particularly in markets. This is expected and it can be a fun way to experience local culture. Tourism is continuing to grow throughout the country. While prices still remain cheap, demand picks up a little more every year and you can expect that to be reflected in the price of everything from hotel rooms to meals soon enough. While it still trails neighboring countries in its popularity, Nicaragua is on the rise and it will only continue to grow in the coming years. Many people choose to visit Nicaragua through a volunteer program. There are many different organizations that run programs to the country and, like anything else, some are better than others. Most will require you to a pay a fee for this opportunity. Make sure you understand exactly where your money ends up. Also make sure you're completely knowledgeable of what type of programs you'll be working with and participating in. You do not want to arrive and find there is little to do and worse yet, you don't want to find that you've displaced a local worker and taken a much needed job. Nicaragua is famed for its "Chicken Buses." These intercity buses travel throughout the country and service as public transportation for residents and tourists alike. They are most often old American school buses that have been repainted to have a little more style and flare. More often than not there will be some form of lively music playing and you'll find yourself sitting next to some form of livestock. It's a great experience and an opportunity that is not to be missed while you're in the country. Be prepared to negotiate hard for your taxi price, particularly in the city of Managua. There is no shortage of taxis so don't be afraid to let one go on by until you find one that offers you a suitable rate. Make sure the rate has been firmly set before you get in the car. Also don't be surprised if the driver picks up other passengers along the way. This is standard practice if there are others who are headed in roughly the same direction. It's important that you carry small bills with you while you're traveling throughout the country. Most people don't have change for larger bills and it can be very frustrating to try and pay for something when nobody can make change. If you're crossing the border from a neighboring country head to the bank before you leave and ask them to give you very small Nicaraguan bills. This will help you out tremendously. Ometepe: This large and dramatic island in Lake Nicaragua is made from two beautifully distinct volcanoes. A visit to the island offers all kinds of opportunities, from hiking and mountain climbing, to swimming at the base of an impressive waterfalls or exploring a coffee plantation. 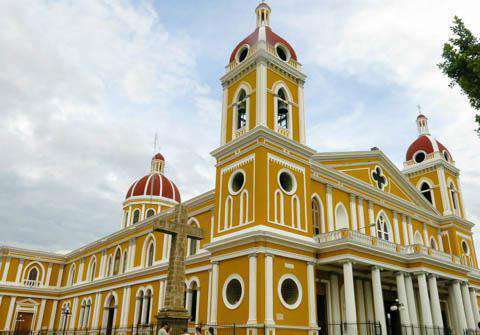 Granada: Granada is a popular tourist destination and beautiful colonial city with impressive homes and churches. It is a great place to relax and wander for a few days during your visit to Nicaragua. Lake Nicaragua: The largest lake in Nicaragua, Lake Nicaragua is home to the famed (although likely extinct) freshwater sharks. It's a unique ecosystem and a popular destination in the country. Like elsewhere in Central America, Nicaraguan food is based on rice and beans. Most dishes have a meat component and fried plantains to accompany it. The meals are usually filling and cheap. Street food is generally a good option if you are looking for cheap snacks. There are also many buffet style restaurants, referred to as fritanga, that offer good lunch and dinner options. Pipian o ayote: This is a creamy potato stew that is one of the few vegetarian options in Nicaragua. It can be filling and hearty and is available in many restaurants. Nacatamales: This large tamale dish is made with pork or beef and other seasonings. Making it can be a production so it is typically served on Sundays as part of a large meal or during celebratory meals. It is usually accompanied by bread and Nicaraguan coffee. Indio Viejo: This meal is made with cornmeal and either beef or shredded chicken and flavored with mint. It is often served with chilero, which is a cured onion and chile mixture.